Over the past years, regulators in many jurisdictions have mandated the use of the Legal Entity Identifier (LEI) to evaluate risk, take corrective steps, minimize market abuse and improve the accuracy of financial data. The LEI Regulatory Oversight Committee (LEI ROC), representing public authorities from around the globe that are together committed to increasing transparency in financial markets, recommends that each individual jurisdiction consider adopting an LEI strategy that meets their needs. The LEI ROC progress report published in April 2018 points out that this could “help overcome the existence of several domestic identifiers covering different types of entities” and “allow countries to leverage the infrastructure developed by the [Global LEI System]”. In light of this premise, the Global Legal Entity Identifier Foundation (GLEIF) and the U.S.-based Data Foundation have joined forces to explore how LEI adoption by U.S. federal agencies could streamline entity identification and produce benefits within and beyond financial markets. To this end, we have carried out comprehensive research on the entity identification systems currently deployed across the U.S. government. Based on the research findings, GLEIF and Data Foundation published the report titled ‘Envisioning Comprehensive Entity Identification for the U.S. Federal Government’. Explores the current landscape of U.S. federal agencies’ entity identification needs and describes the entity identification system that each uses. Compares the Global LEI System to the other systems currently in use in the U.S.
Identifies how U.S. federal agencies would benefit from replacing proprietary or internal identifiers with the LEI. Proposes factors that describe the feasibility of a particular U.S. entity identification system to convert to a comprehensive entity identification system built on the LEI or, alternatively, the value of mapping existing identifiers against the LEI. This research demonstrates that the U.S. federal government uses fifty distinct entity identification systems—all of which are separate and incompatible with one another. Entity identification, therefore, continues to represent a significant challenge for many federal agencies’ missions. Any agency tracking non-federal entities in order to perform a regulatory, statistical, procurement, or assistance function must either create its own entity identification system or else adopt one originally created by another agency. Both approaches present difficulties in matching entities and properly assigning legal responsibility. Refer to the appendix in the GLEIF and Data Foundation research report for a glossary of abbreviations shown in the graph. If implemented properly, a comprehensive entity identification system based on the LEI could help identify and mitigate risk in markets, track and debar low-performing contractors and improve supply chain efficiency. It could also help regulators, statisticians, contract and grant officers, corporate actors, and researchers to understand how an entity acts and interacts with government across sectors and industries, painting a more complete picture of economic and organizational activity in the United States. In summary, the joint GLEIF and Data Foundation research report shows that a comprehensive, open and standardized entity identification system could be useful anywhere a government-to-business relationship exists. The LEI could serve this purpose. GLEIF emphasizes that the findings in this research report may serve to inform regulators in jurisdictions other than the U.S. where public authorities continue to rely on a multitude of identification regimes, some being proprietary. The LEI responds to the critical need for a universal system of identifying entities across markets, products, and regions. Broad LEI adoption and the resulting access to open, standardized and high quality reference data available via the Global LEI Index will allow all stakeholders in any country to improve interoperability and interconnectedness. Easier counterparty identification based on the LEI will open the door to further automation and digitization and make it easier and safer for businesses and citizens to participate in the digital marketplace. It should also be considered that alignment on the LEI as the standard entity identifier will significantly lower the cost and burden for businesses subject to regulation mandating an entity identifier. Having to obtain a host of different local and proprietary identifiers to ensure compliance with rules and regulations at both the national and international level is particularly burdensome for small and medium-sized enterprises. Benefits for the LEI are significant for all who are involved with financial transactions. Operational efficiencies, cost savings, reduction of time to transact and more reliable information can be gained by introducing the LEI into any process that requires identification and verification of a counterparty. It also supports the objective of public authorities to increase transparency in financial markets and beyond. 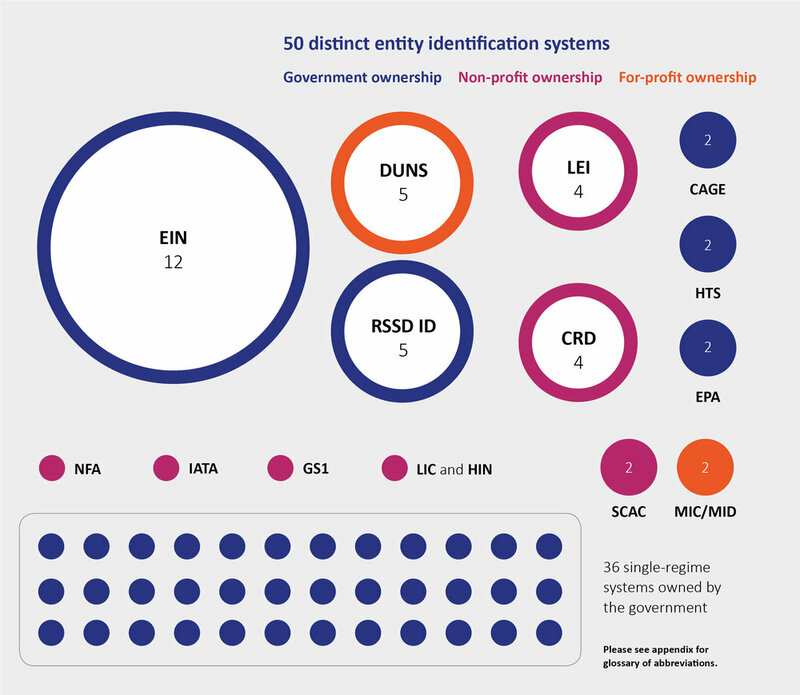 About GLEIF: Established by the Financial Stability Board in June 2014, the Global Legal Entity Identifier Foundation (GLEIF) is a not-for-profit organization created to support the implementation and use of the Legal Entity Identifier (LEI). GLEIF is headquartered in Basel, Switzerland. GLEIF services ensure the operational integrity of the Global LEI System. GLEIF also makes available the technical infrastructure to provide, via an open data license, access to the full global LEI repository free of charge to users. GLEIF is overseen by the LEI Regulatory Oversight Committee, which is made up of representatives of public authorities from across the globe.